A massive protest erupted at the power centre of the country’s capital on Saturday as hordes of angry youth clashed with police, demanding better security for women in Delhi in the aftermath of the gangrape of a 23-year-old woman last week. The protestors, estimated at between 10,000 and 12,000 by the police, were lathicharged at least eight times through the day. About 125 tear gas shells were fired and water cannons also used to disperse them as they tried to barge into Rashtrapati Bhawan to meet the President. About 35 protestors and 37 policemen, including two DCPs, were injured in the violence. One Delhi Police constable and one RPF inspector suffered serious head injuries. Six buses, two motorcycles and two other vehicles belonging to the police and DTC were damaged. A case of rioting and destruction of public property is being registered and action will be taken against protestors identified through media footage, police said. Late in the night, Congress president Sonia Gandhi met some protestors outside her residence and assured them that steps would be taken to boost the safety of women. She also said a change in the mindset of society was needed to tackle the problem. In the morning, the protest started at around 9 am when some 100 young men and women, mostly students, began marching towards Rashtrapati Bhawan. At around the same time, former Army chief V K Singh also held a protest march at India Gate. Representatives of the Bhagat Singh Kranti Sena, Bharat Swabhiman Trust and student unions such as SFI and AISA also joined the demonstration. But they were all stopped by police who had a four-tier security ring in place on Rajpath. At around 11 am, when a group of protestors turned violent and broke a barricade, police advised them to remain calm and peaceful. However, the protestors did not pay heed and continued to march towards Rashtrapati Bhawan. The protestors then pelted stones, threw shoes and bottles at police officials, forcing them to use water cannons. The police made another announcement asking the crowd to disperse. However, when the crowd persisted, police lobbed tear gas shells and continued using water cannons. Police had to resort to lathi charge when buses and a few motorcycles were damaged by some protestors. Later, police had to take two damaged buses towards Rajpath and form a security wall of local police and other forces. But the lathi charge did not stop the students from marching towards Rashtrapati Bhawan. On several occasions, the protestors tried to break the security cordon, forcing the police to fire another round of tear gas shells and again resort to lathi charge. Despite several requests by the police to protest at the India Gate lawns, the protestors remained adamant and sat on the road in front of the barricades, hurling abuses at the police. Shouting “We want justice”, the protestors burnt an effigy of Ram Singh, the main accused in the gangrape of the 23-year-old woman last Sunday, and also carried out his mock hanging on a pole outside Rashtrapati Bhawan. The protestors claimed that their initial plan was to assemble at India Gate and demonstrate for three hours. Many youth said they learnt about the protest through social networking sites such as Facebook and Twitter and through Blackberry Messenger. Others said they joined in after seeing the protest on TV news channels. The protestors were mostly school and college students who had come from Gurgaon, Noida and South Delhi. Besides pelting stones, the students also hurled coins, bangles, mud and plants and whatever else they could lay their hands on, at the security personnel. 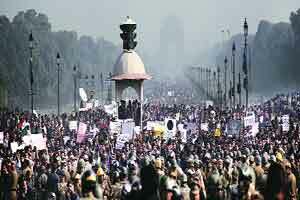 Many also climbed the poles along Rajpath holding placards against the police. Later in the evening, after failing to get access to Rashtrapati Bhawan, the protestors tried reaching Parliament but were immediately lathi charged. A few minutes later, a candle march was organised at India Gate. By 10 pm, about 400 protestors remained at Vijay Chowk, singing bhajans and holding candles. A group of 100 people who had been stationed at India Gate through the evening were seen walking towards Raisina Hill. “We are expressing our solidarity with the victim. This needs to be done to show the government that this anger is genuine and won’t go away quickly,” said Sandeep Bhardwaj, one of those in the group. 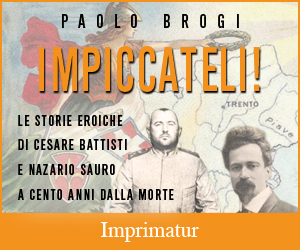 ← Napolitano bacia i due marò. Ma non erano indagati per omicidio dalla Procura di Roma?